Choruses, vocal ensembles, quartets and more. 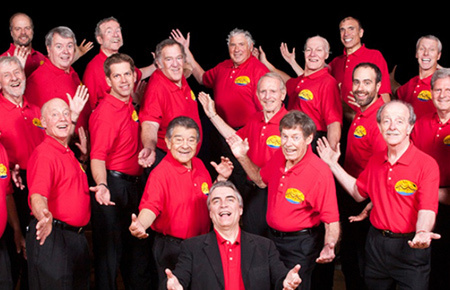 The Marin Golden Gate Barbershop Chorus is a group of a cappella singers who enjoy the exciting close harmonies of the unique Barbershop style. We provide a healthy and fulfilling hobby for people of all ages who love to sing. Membership does not require training in music and voice as we are skilled at teaching our members to learn and memorize the arrangements. We regularly compete in Far Western District and Division competitions. We provide chorus or quartet performances to civic and business groups as well as organizations such as sports teams, rehabilitation hospitals, and assisted living facilities. We offer holiday sing outs, Singing Valentines, and entertain the public once a year with a major concert held at a local theater. We cordially invite you to come and meet our exceptionally talented Director Deborah Benedict and to experience the joy and benefits of Barbershop harmony. Audition policy: Love to sing? Come join us on Monday nights. Dotter's Knot brings a fresh approach to some old familiar ren faire favorites, as well as introducing the audience to some little known material drawn from traditional folk music, with a smattering of original pieces. We feature memorable, sing-able, audience-pleasing melodies, and intricate harmony. 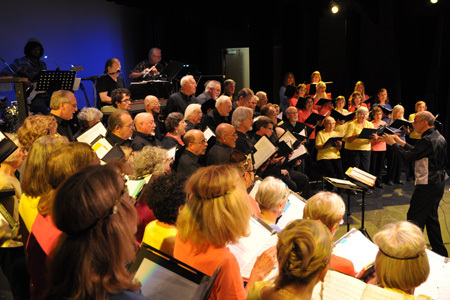 From our 1970s beginnings at a San Rafael pub, our Mayflower Chorus has kept its spirit of fun and fellowship as it has grown in musical excellence and community stature. We are professionally directed, but all organizational tasks rely on multitalented member volunteers. We perform two lively scripted shows each year at Marin Center, and sing at community events in Marin and beyond. Our captivating choral arrangements range from light classical through contemporary pop to comic novelty numbers. Soloists and ensembles from within the chorus enliven our programs. The chorus will visit Croatia this summer on its fifth international tour. 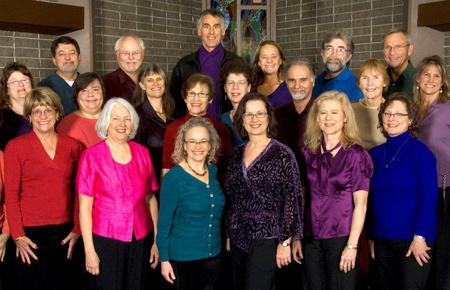 Our parent non-profit, Mayflower Choral Society, supports the chorus, honors leaders in the Marin Arts community and grants musical scholarships. Yes M'am made up of three dynamic female vocalists who teamed up in December of 2014 to create a trio with saucy, spicy and surprising harmonies. With roots deep in American folk traditions, Yes M'am! takes the stage with a capella songs that are at times funny, soaring, moving, and deeply powerful. They specialize in singing traditional folk songs, as well as music that wouldn't necessarily be thought of folk before they put our particular (if not peculiar) spin on it. Led by Pollyanna Bush on the 3rd Saturday of every month, SoarSing unites people and offers soul nourishment through the magic of group singing. 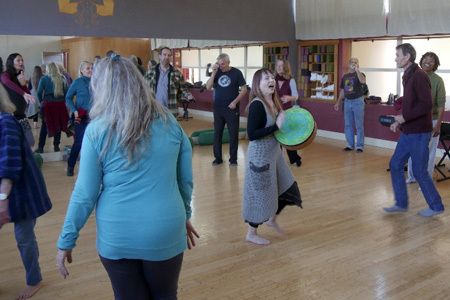 During the interactive session, participants are invited to connect with others through vocal expression, guided to sing in harmony with interlocking melodic and rhythmic parts and encouraged to explore their creative impulses in a welcoming and supportive environment. 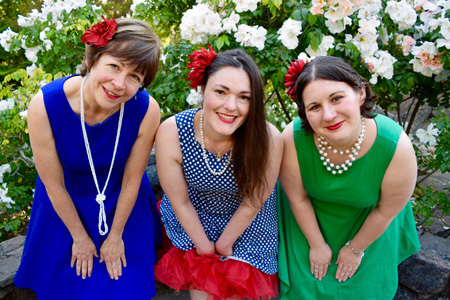 "Rita & The Cosmos" is a Marin based a cappella singing group of six sassy gals. 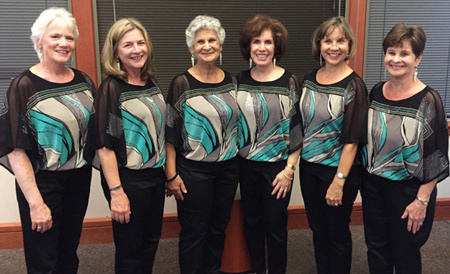 Our group (as pictured left to right: Bobbi, Carolyn, Toni, Rita, Lauren and Gloria) was formed in 2005 when Rita assembled some musically inclined friends. Our repertoire includes a mixture of standards, jazz, pop and Broadway tunes, featuring original, upbeat, four part arrangements that will get your fingers snapping and your toes tapping! The songs reflect themes of friendship, spirituality, romance and love. Selections by Berlin and Gershwin are among the crowd-pleasing favorites. We perform at formal and informal events including cocktail and dinner parties, holiday celebrations, other special occasions, as well as at senior living centers in counties throughout the Bay area. Requests for personalized parodies are happily accommodated. 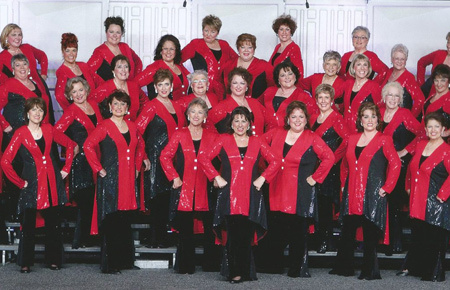 Pacific Empire Chorus is the premier northern California women's, 4-part a cappella, award winning mid-sized chorus. PEC is a 501c(3) organization, dedicated to bringing a cappella harmony, to women of all ages throughout Sonoma, Marin and Napa counties. Come visit the Pacific Empire Chorus and experience for yourself the love of harmony, friendship and singing that we share each week. 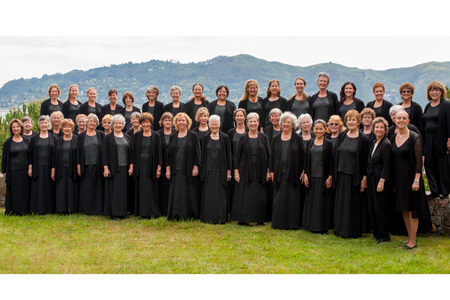 Audition policy: Pacific Empire Chorus welcomes women who love to sing and are striving for excellence. If you are in the San Francisco Bay Area, please join our rehearsal any Wednesday evening. 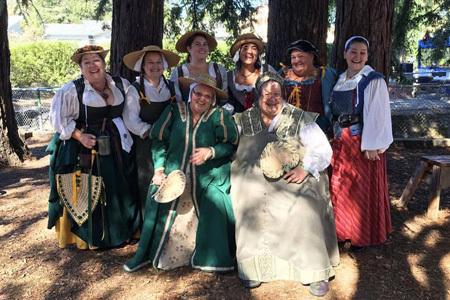 Founded in 1992 by singer/composer Margy Crowningshield, singers Cynthia Frank and Sharon Hansen, and poet Karin Faulkner, the Mendocino Women's Choir has been together for almost twenty years. 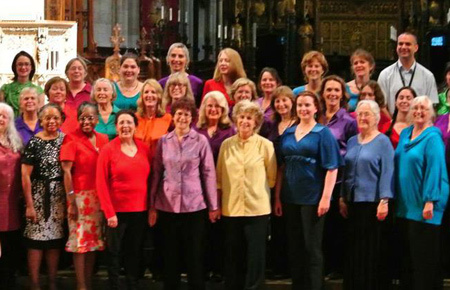 We're a feminist, progressive, loving and sassy, non-audition community choir. Over the years, the size of our choir has varied from 24 to 105 singers (yikes! ), and our ages have ranged from 14 to 75. We perform a variety of music, from Mozart to Bartok, Bulgarian folk music to America doo-wop, Holly Near to Gregorian chant, and PDQ Bach to gospel. Singers Marin, (Choral Singers of Marin) is an association of choruses that was founded to serve the community and preserve the integrity of the choral art. Singers Marin provides singers of all ages the opportunity to experience the joy of making music together and bring that joy to the community through our outreach program and public concerts. Most importantly, we strive for the highest level of musical standards in all of our presentations. Specializing in doo wop and jazz arrangements, Marin Harmony has been in existence for 13 years, formerly known as Urban Harmony. A prize-winning contestant at the Marin County Fair in 2010, Marin Harmony is a fun loving community who brings joyous entertainment to families, friends, retirement communities and to each other. 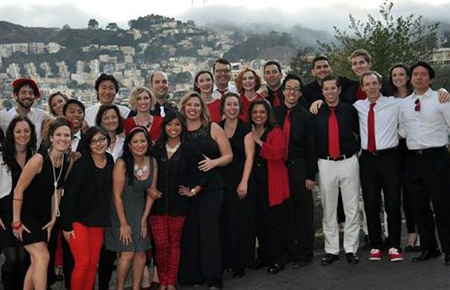 We're Scales of the City, a San Francisco co-ed a cappella group that performs all around the Bay Area. Based on the model of a collegiate glee club, we're a group of performers who love singing pop music from our childhoods and today, with a sprinkling of showtunes just for kicks. We're all about making great music to share, and having a great time doing it. Audition policy: Scales of the City holds auditions at the beginning of each season (usually in January) and occasionally on an as-needed basis to fill vacant positions in the group. 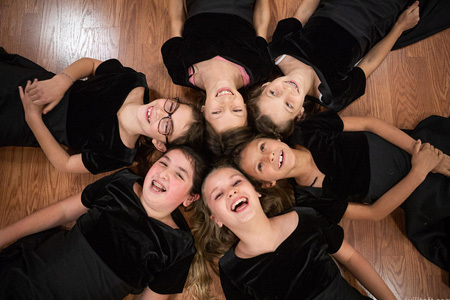 Singing with a group of friends is not only a fun, creative and rewarding way to spend some time but more and more studies are showing the various health, social and general well being of group harmony singing. Join a chorus today!